The Dancing Master Calipers are a classic Victorian era tool design, made new with a simple, modern approach to toolmaking. Made of Stainless Steel, these calipers are made in the classic manner, two "legs" joined by a single rivet at a pivot point in the top. They can be used as both inside and outside calipers, registering off of the "toes" or "heels" of the tool. 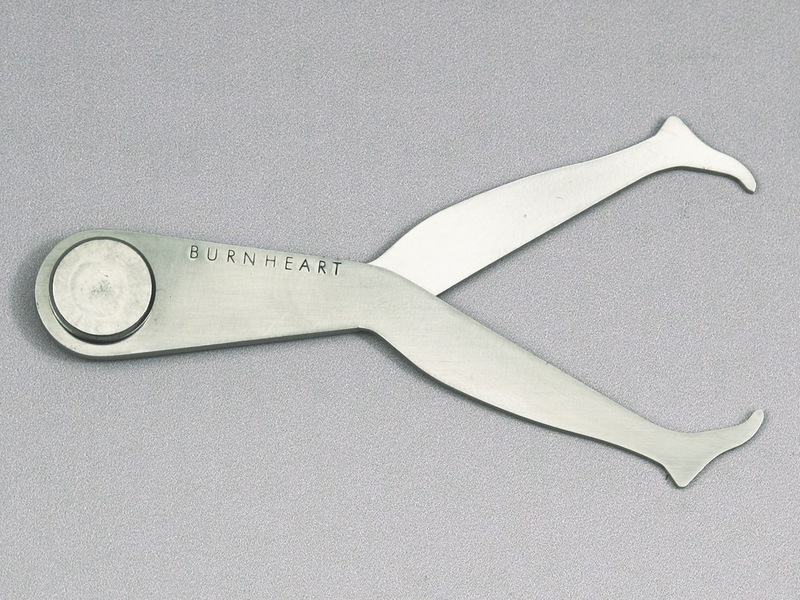 The first "Legged" calipers started appearing in the late 18th century, and were common up until the turn of the 20th century. Tools in the Victorian era were becoming more ornate and elaborate, and these often shop-made tools were a part of this movement. They may also have been a bit "naughty" by 19th century standards, but not to worry- the legs I offer are strictly gender-neutral. My interest in making this tool stems from my own desire to purchase a pair, after learning about their existence. Part folk art, part shopmade tradition, these tools have become increasingly rare and desirable. After reading up on them, and understanding that each is unique, suited to the taste of the maker, I decided not only did I want to make a pair of my own, but I wanted to offer it as a product, in line with my revival of other ancient/bygone tools of measurement. They are 3.5" and made for smaller work, registering inside or outside diameters up to 6". They can be used to store a measurement, transfer between pieces or register against a plan, sketch or ruler while turning. Perfect for turners, penmakers, machinists, woodworkers and hobbyists at large. Each caliper is assembled in the same traditional fashion, with hand peened rivets, and so each rivet and washer look slightly different, bearing tool marks from the process. If your calipers loosen over time, a quick strike with a ball peen hammer on the washer side of the rivet, backed against something solid, should tighten the calipers. Should you over tighten them, a few drops of oil and a little repetitious opening and closing should ease the joint.